Could Verizon Communications Be a Millionaire-Maker Stock? Verizon stock is probably a safe haven for fairly risk-averse investors. Shares of telecom giant Verizon (NYSE:VZ) were a relatively safe place to be in 2018. The stock posted a reasonable gain over the year -- nearly 4.7% -- and, on top of that, paid out respectable quarterly dividends. By contrast, the Dow Jones Industrial Average actually had a negative total return over the course of 2018. I'll cut right to the chase and answer the question that I posed in the headline: No, Verizon stock probably isn't going to make you a millionaire over the long term unless your up-front investment in the shares is already quite substantial and/or your time horizon is quite long. Verizon is a relatively safe way to benefit from the popularity of smartphones because the company's revenue is fairly independent of the rate at which consumers buy new smartphones. What does impact Verizon's core wireless business is how much data those smartphone buyers use (Verizon charges more for smartphone plans that allow users to consume more data per month), as well as how successful it is at retaining customers. Verizon, clearly, isn't the only game in town, but it's one of the biggest and most successful -- and the barriers to entry in telecom are significant. This is in stark contrast to a company like Apple (NASDAQ:AAPL), which depends on being able to sell a bunch of new iPhones each year to profit from the smartphone market. There are numerous risks there, such as slowing smartphone upgrade cycles and increasingly intense competition. 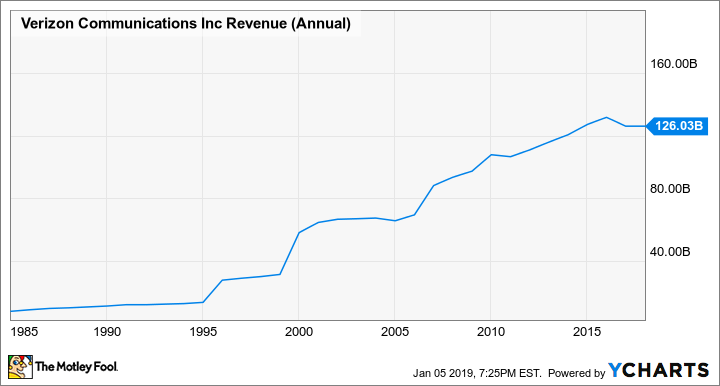 That stability is what allows Verizon to profit in both good times and in bad (the company actually posted revenue increases in both 2008 and 2009) and to reliably pay a significant dividend that has been growing consistently. VZ Revenue (Annual) data by YCharts. Telecom companies often pay substantial dividends to help make their shares more appealing (since, after all, telecom companies generally aren't known for delivering explosive revenue growth). As of this writing, the company's dividend on an annualized basis stands at $2.41 per share, translating into a dividend yield of 4.28%. That's not the biggest dividend you can find in the broader sphere of technology and telecom stocks, but it's certainly more than respectable. Again, that dividend in itself probably isn't going to make you a millionaire unless you're really close to being one already, but what it can do is potentially compound your returns if you reinvest the dividend in the shares (the shares that you buy will also pay dividends). Or, if you're a retiree or looking to be one relatively soon, it could be a good way to generate a meaningful income stream while also affording you the opportunity to enjoy share-price appreciation, should it occur.